Twisty swirls of bright soil on the lunar surface have long fascinated scientists. An early theory said the swirls were caused by anomalies in the lunar crust’s magnetic field. New computer simulation techniques suggest a different cause: Crashing comets. PROVIDENCE, R.I. [Brown University] — Brown University researchers have produced new evidence that lunar swirls — wispy bright regions scattered on the Moon’s surface — were created by several comet collisions over the last 100 million years. In a paper published in the journal Icarus, the researchers use state-of-the-art computer models to simulate the dynamics of comet impacts on the lunar soil. The simulations suggest that such impacts can account for many of the features in the mysterious swirls. “We think this makes a pretty strong case that the swirls represent remnants of cometary collisions,” said Peter Schultz, a planetary geoscientist at Brown University. Schultz co-wrote the paper with his former graduate student, Megan Bruck Syal, who is now a researcher at the Lawrence Livermore National Laboratory. Lunar swirls have been the source of debate for years. 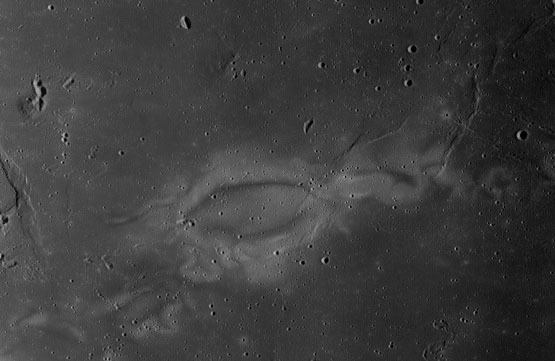 The twisting, swirling streaks of bright soil stretch, in some cases, for thousands of miles across the lunar surface. Most are found on the unseen far side of the Moon, but one famous swirl called Reiner Gamma can be seen by telescope on the southwestern corner of the Moon’s near side. “It was my favorite object to look at when I was an amateur astronomer,” Schultz said. In the 1970s, scientists discovered that many of the swirls were associated with anomalies of the Moon’s crustal magnetic field. That revelation led to one hypothesis for how the swirls may have formed. Rocks below the surface in those spots might contain remanent magnetism from early in the Moon’s history, when its magnetic field was much stronger than it is now. It had been proposed that those strong, locally trapped magnetic fields deflect the onslaught of the solar wind, which was thought to slowly darken the Moon’s surface. The swirls would remain brighter than the surrounding soil because of those magnetic shields. But Schultz had a different idea for how the swirls may form — one that has its roots in watching the lunar modules land on the Moon during the Apollo program. Comets carry their own gaseous atmosphere called a coma. Schultz thought that when small comets slam into the Moon’s surface — as they occasionally do — the coma may scour away loose soil from the surface, not unlike the gas from the lunar modules. That scouring may produce the bright swirls. Schultz first published a paper outlining the idea in the journal Nature in 1980. That paper focused on how the scouring of the delicate upper layer of lunar soils could produce brightness consistent with the swirls. The structure of the grains in the upper layer (termed the “fairy castle structure” because of the way grains stick together) scatters sun’s rays, causing a dimmer and darker appearance. When this structure is stripped away, the remaining smoothed surface would be brighter than unaffected areas, especially when the sun’s rays strike it at certain angles. For Reiner Gamma on the lunar nearside, those areas appear brightest during the crescent Moon just before sunrise. As computer simulations of impact dynamics have gotten better, Schultz and Bruck-Syal decided it might be time to take a second look at whether comet impacts could produce that kind of scouring. Their new simulations showed that the impact of a comet coma plus its icy core would indeed have the effect of blowing away the smallest grains that sit atop the lunar soil. The simulations showed that the scoured area would stretch for perhaps thousands of kilometers from the impact point, consistent with the swirling streaks that extend across the Moon's surface. Eddies and vortices created by the gaseous impact would explain the swirls’ twisty, sinuous appearance. Taken together, the results offer a more complete picture of how the swirls form, the researchers say.